The Breeze BH1 chair creates a sleek minimalistic look for any boardroom or office enviroment. The breathable nylon mesh gives a light and airy appearance as well as offering ventilation to reduce heat build up and muscle fatigue. The mechanism features an anti-shock, lockable knee tilt mechanism with tension adjuster to suit the weight of the user.. 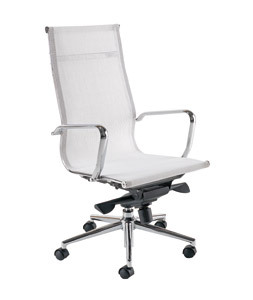 The Breeze BH1 chair creates a sleek minimalistic look for any boardroom or office enviroment. The breathable nylon mesh gives a light and airy appearance as well as offering ventilation to reduce heat build up and muscle fatigue. The mechanism features an anti-shock, lockable knee tilt mechanism with tension adjuster to suit the weight of the user.